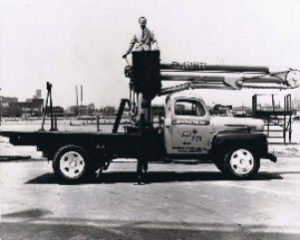 My Name is Brian DePiero Son the the founder Ernest E DePiero and as a young boy being around starting with running my first model 4100 Skyworker in about 1963 at the age of 7 shown in the photo. Having worked for my Dad from 1971 to 1975 part time going through high school and starting full time in 1976 and leaving on Feb 28, 1994. Starting by cleaning up, to servicing sky-workers, parts department manager, manufacturing for the first 3 years of hands on production of the Aerial Lift of CT VP to sales / production manager in 1983 than for 10 more years producing the most ever in a single year of 239 Aerial Lifts.